Molds (American English) or moulds (British English) are microscopic, multicellular fungi. They are generally composed of hyphae (filamentous structures) that are usually separated from each other by divisions called septa. They are genetically similar to yeasts (single-celled fungi). Fungi (singular fungus), which also include mushrooms, mildews, and yeast, make up one of the kingdoms in biological classification and are eukaryotic organisms that digest their food externally and absorb the nutrient molecules into their cells. Fungi differ from bacteria in having a cell nucleus; from plants in not making their own food through photosynthesis; and from animals in not being mobile and in absorbing nutrition externally rather than internally. Molds do not form a specific taxonomic grouping. They can be found in the divisions Zygomycota, Deuteromycota, and Ascomycota. Xerophilic molds use the humidity in the air as their only water source; other molds need more moisture. 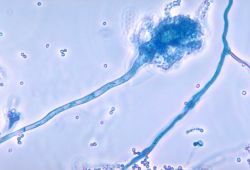 The molds Neurospora crassa and Aspergillus nidulans are commonly used model organisms. Molds are often viewed negatively as causes of food spoilage and allergies. However, they serve important purposes, including key ecological roles as primary decomposers of dead organic matter, and in the production of foods (such as cheese) and antibiotics (such as penicillin). Slime molds and water molds are not fungi, and thus not true molds. Slime molds (or slime moulds) are peculiar protists that normally take the form of amoebae, but under certain conditions develop fruiting bodies that release spores, superficially similar to the sporangia of fungi. Water molds (or water moulds) or oomycetes are a group of filamentous, unicellular protists, physically resembling fungi. There are thousands of known species of molds. They have long hollow tubes called hyphae, which aggregate into a dense network known as mycelium. The mycelium grows through the medium on which the mold feeds. The primary energy source for molds is organic matter, which is broken down into simpler compounds by enzymes released from the mycelia. Molds are important decomposers of dead plant and animal matter. By decomposing organic matter, molds play a big part in material biodegradation, enabling decay and rot necessary in all ecosystems, releasing carbon and other materials back into the environment where they can be reused by plants. The enzymes and mycotoxins released by molds can inhibit the growth of other molds and microorganisms. Some mycotoxins are considered to be harmful to health. 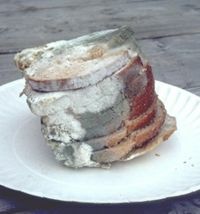 As decomposers, molds are a big cause of the spoilage of foods, and can often be seen growing on food left too long in a refrigerator. They also can damage clothing and wood and other building materials. Molds, like all fungi, need moisture to grow, so the best way to prevent damage from them is too avoid dampness. Although molds grow on organic matter everywhere in nature, their presence is only visible to the unaided eye where conditions allow mold colonies to grow. In man-made environments, humidity and temperature are often stable enough to foster the growth of mold colonies, commonly seen as a downy or furry coating growing on food or surfaces. Thus buildings, being stable environments, enable mold proliferation. Molds reproduce through small spores, which can remain airborne indefinitely. Spores are able to survive extreme temperatures and pressure. Some molds can begin growing at temperatures as low as 2 °C. When conditions do not enable growth, molds can remain alive in a dormant state, within a large range of temperatures before they die. This explains how molds can survive harsh conditions such as containers in refrigerators or inside building structure cavities. Moving air may prevent mold from growing since it has the same desiccating effect as lowering humidity. Although the presence of mold may indicate unwanted decomposition, some molds are cultivated deliberately for their byproduct compounds. 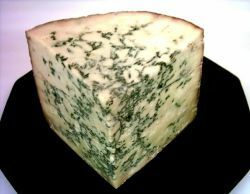 Examples include making certain types of moldy cheese, and for the production of antibiotics derived from their natural defenses against bacteria. Alexander Fleming's famous discovery of the antibiotic penicillin came from the mold Penicillium notatum. Food sources for molds in buildings include cellulose-based materials, such as wood, cardboard, and the paper facing on both sides of drywall. Carpet contains dust and other organic matter. Mold colonies are commonly seen in damp areas, such as basements and bathrooms. Mold colonies also grow inside building structures. Growth is fostered by the moisture in a building's structure, especially following floods and water leaks. Sometimes its presence is seen on wall surfaces; it may produce an identifiable smell. The main problem with the presence of mold in buildings is the inhalation of mycotoxins. 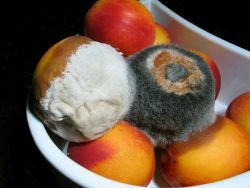 All organic matter is a food source for mold; soap, paper, wood, and dust are just a few examples. If a house has excessive mold, there is usually too much moisture in the house, possibly from the basement, a leaking roof, or leaks from plumbing pipes behind the walls. Insufficient ventilation can also cause moisture build-up from normal human activities such as taking showers and baths and cooking. Mold colonies often form where ventilation is poorest, and on perimeter walls, because they are coolest, thus closest to the dew point. If there are mold problems in a house only during certain times of the year, then it is probably either too air-tight, or too drafty. Mold problems occur in airtight homes more frequently in the warmer months (when humidity reaches high levels inside the house, and moisture is trapped), and occur in drafty homes more frequently in the colder months (when warm air escapes from the living area into unconditioned space, and condenses). If a house is humidified artificially during the winter, this can create conditions favorable to mold. In extreme cases of mold growth in buildings, it is easier to condemn the building rather than clean the mold to human-safe levels. Cultured molds are used in the production of foods including cheese (Penicillium spp), tempeh (Rhizopus oligosporus), quorn (Fusarium venenatum), the black tea pu-erh. and some sausages. Soy sauce and miso production uses the mold Aspergillus oryzae and other microorganisms to ferment a soybean and wheat mixture. Penicillium, in addition to its usefulness in the production of cheese, is especially invaluable as the source of antibiotics. It is estimated that penicillin has saved at least 200 million lives since its first use as a medicine in 1942. Some mycotoxins produced by molds are known to be harmful to health in all people. Other mycotoxins cause immune system responses that vary considerably, depending on the individual. The duration of exposure is a key factor in triggering immune system response. Farm animals often die or suffer from mycotoxin poisoning. Mycotoxins resist decomposition from cooking, and remain in the food chain. Spores can be allergenic. When inhaled, mold spores may germinate, attaching to cells along the respiratory tract and causing further problems in those with weak immune systems. One example is Stachybotrys chartarum, which has been associated with sick building syndrome. Malmberg, P., A. Rask-Andersen, M. Lundholm, and U. Palmgren. 1990. “Can Spores from molds and Actinomycetes cause an organic dust toxic syndrome reaction?” American Journal of Industrial Medicine 17: 109-110. Morrow, M. B., H. Prince, and S. A. Selle. 1937. “Molds in the etiology of asthma and hay fever: a preliminary report.” Texas State Journal of Medicine 30: 754-762. Morrow, M. B., and H. E. Prince. 1962. “Factors affecting mold growth and dissemination.” Review of Allergy and Applied Immunology 16 (1962): 476-478. Rudeschko, O., A. Machnik, H. Dorfelt, H. -H. Kaatz, B. Scholott, and R. W. Kinne. 2004. “A novel inhalation allergen present in the working environment of beekeepers.” European Journal of Allergy & Clinical Immunology 59(3): 332-337. All links retrieved October 13, 2018. This page was last modified on 13 October 2018, at 16:17.